Demonstrators rally outside of the US Supreme Court during oral arguments in Sebelius v. Hobby Lobby March 25, 2014 in Washington, DC. Can you imagine what would happen if birth control were subsidized in the United States? It might seem like a dream for reproductive rights-minded women in the US, particularly as reproductive rights were dealt some serious blows in 2014 — recall the Supreme Court ruling that allowed employers to opt out of covering birth control for employees for religious reasons. As Lauren Barbato over at Bustle points out, the "Hobby Lobby" ruling was particularly damaging because it cements the idea that "a company owner's 'religious freedom' trumps an employee's right to choose a form of health care." While access to birth control and abortion are hot topics in the US, there are some places where the pill is more readily available. 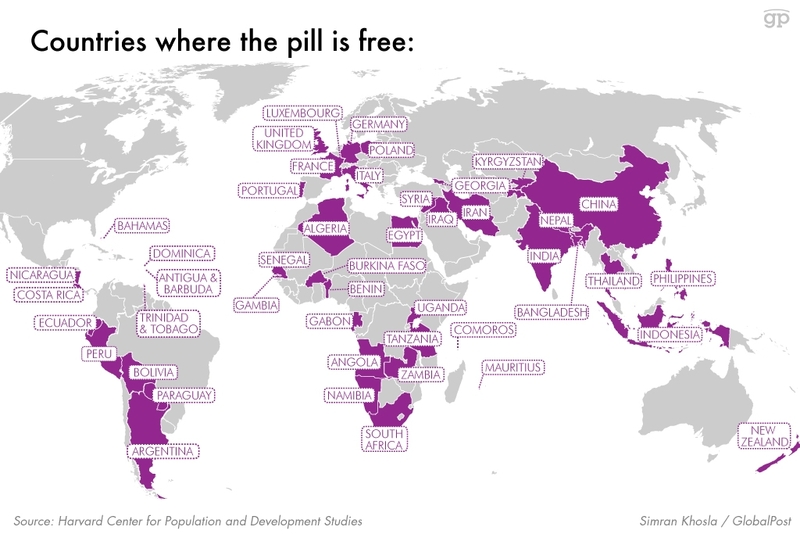 We've pulled together a map of the countries where the pill is free due to government subsidies. This map is compiled of data from a 2011 Harvard Center for Population and Development Studies, curated by Slate, which examined reproductive laws around the world.